You could say this Tomato, Mozzarella & Arugula Naan Pizza I made is sort of a cross between a caprese pizza and a BLT. It has tomatoes, mozzarella, pancetta and arugula all on top of naan bread. Oh YUMMMM! I think some of my best creations happen when I’m trying to use up what’s in the refrigerator before going out of town. Like this pizza. I bought a big bag of baby arugula to make a Watermelon, Cucumber & Burrata Salad and didn’t use all the arugula. Instead of letting it sit in the refrigerator and get mushy while I was gone, I decided to make something else with it for dinner. I wasn’t really in the mood for another salad though. I was thinking maybe some sort of pasta would be delish. In the end, I decided to use up a couple random pieces of naan I had taking up space in my tiny freezer. So pizza it was! Lucky for me I also had some beautiful tomatoes, both colorful grape tomatoes and regular sized tomatoes, from the farmers market and some fresh mozzarella cheese that I had planned on making a caprese salad with, but never got around to making. Oh well, it sounded perfect to use for this pizza instead. I also discovered a package of diced pancetta in the fridge. Who knows what I originally bought that for? I cooked up the pancetta and used it to top off the pizza. That’s where the caprese meets BLT…as in bacon (close enough, eh?). Yeah, I know arugula isn’t quite like the lettuce in a typical BLT, in fact it’s not even in the lettuce family, but it is green and frequently used in salads like lettuce so I’m making the connection here. I made this Tomato, Mozzarella & Arugula Naan Pizza two ways for comparison. The first was on a baking sheet in the oven, with the larger tomatoes sliced. This method produces a softer crust. Then I tried making another pizza with the grape tomatoes on a pizza screen for a crisper crust. I like to use my pizza screen because I prefer a crisper crust. My husband liked them both. You could also bake the pizzas on a pizza stone if you have one of those. 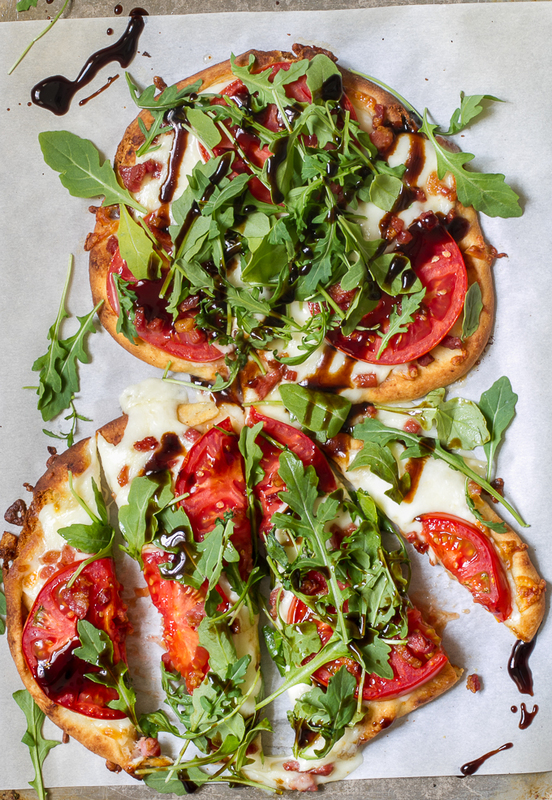 The finishing touch on this Tomato, Mozzarella & Arugula Naan Pizza is a healthy drizzle of one of my favorite things on earth…Balsamic Glaze. You gotta get yourself some of this magic in a bottle. It’s crazy good!!! For those of you wondering what Balsamic glaze is, it’s basically a balsamic vinegar reduction. It’s thick and oh so yummy! You can make your own, but I haven’t done that yet so I don’t have a recipe to offer you. Cook pancetta (or bacon) in pan until crisp. Remove from pan and set aside and keep warm. Brush both sides of naan bread with a little olive oil, then place on baking sheet. If you want a crispier pizza, place the naan on a pizza screen. Top each piece of naan with a couple tomatoes and slices of mozzarella cheese. Bake about 10 minutes, until cheese is melted. 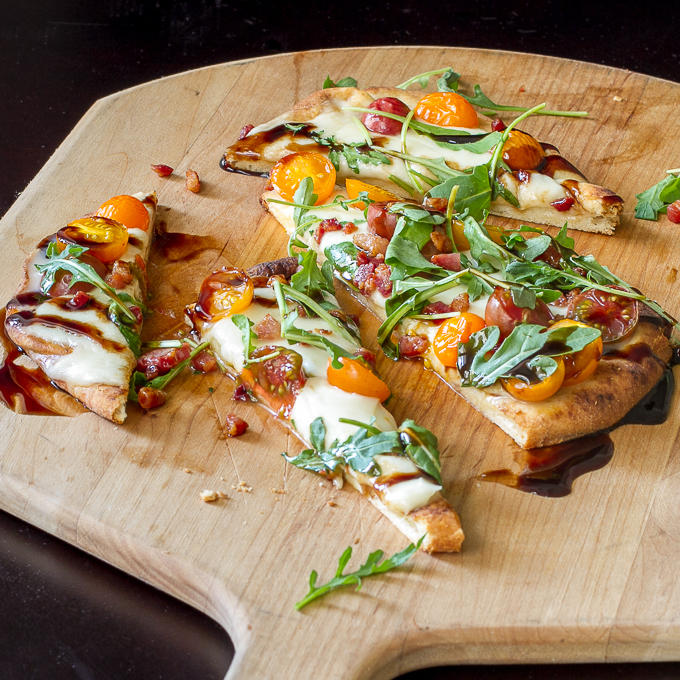 Top each pizza with a handful of arugula and sprinkle pancetta on top. *Balsamic glaze is reduced balsamic vinegar. You can purchase it at the grocery store. This post contains affiliate links. If you purchase a product through an affiliate link, your cost will be the same but I’m Bored, Let’s Go will automatically receive a small commission which helps maintain this blog. Your support is greatly appreciated! Oh my gosh, my mouth is watering. I love, love, love balsamic glaze!!! This looks incredible Judy! Oh how I love it too! Have you ever made it? I think it would be pretty easy. This looks so delicious. I am in love with everything here starting with naan and all the veggies and that aragula on top!! Wow, this looks really scrumptious. It’s a personal size pizza, right? 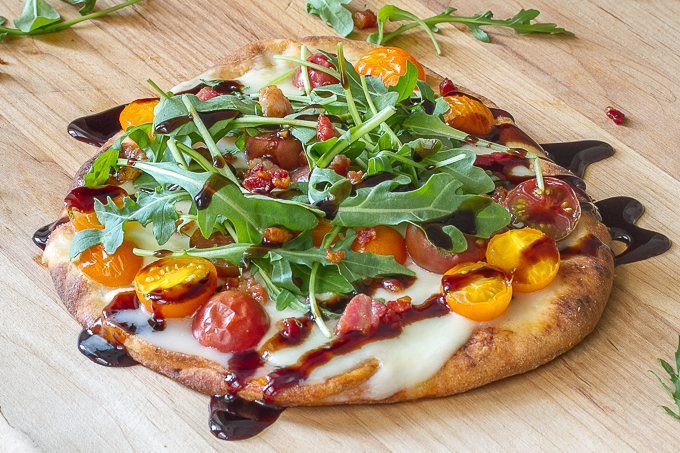 Love the look of your Tomato, Mozzarella and Arugula Naan Pizza. So healthy and yummy! I like easy and simple recipes. Thanks Anita! I like easy too! i could eat any form of caprese every day and be so happy! I love this quick and easy version with naan. Pinned! Thanks for the recipe! 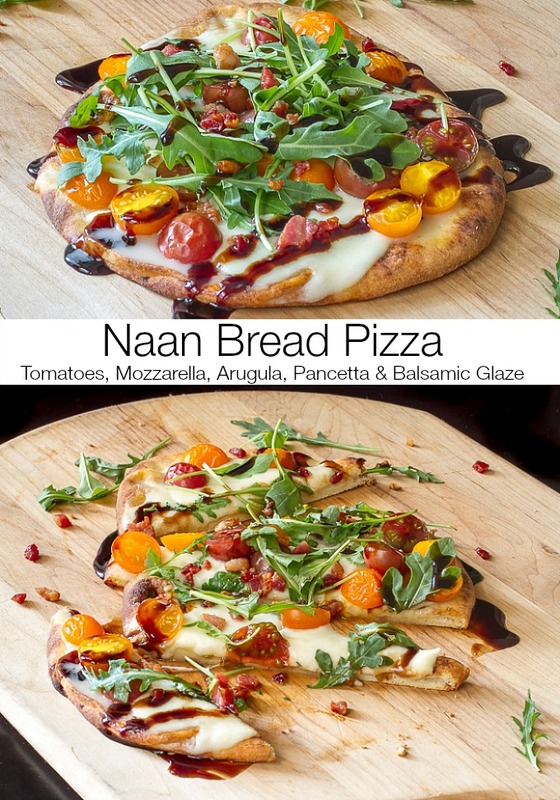 I love naan – and it is a great idea to use it as a pizza base if I don’t feel like messing around with the dough! Never knew you could make pizza with naan and I love it. Couldn’t believe how easy it was to prepareand your photos look incredible. Thank you… Naan is so quick and easy to use! Thanks for the great idea! I used some basil pesto as a “sauce”, topped with fresh mozzarella slices, halved cherry tomatoes, and prosciutto. After baking, finished with arugula and balsamic glaze! So delicious!